Church of Our Redeemer will mark the coming of the season of Lent with our annual Shrove Tuesday Pancake Supper! 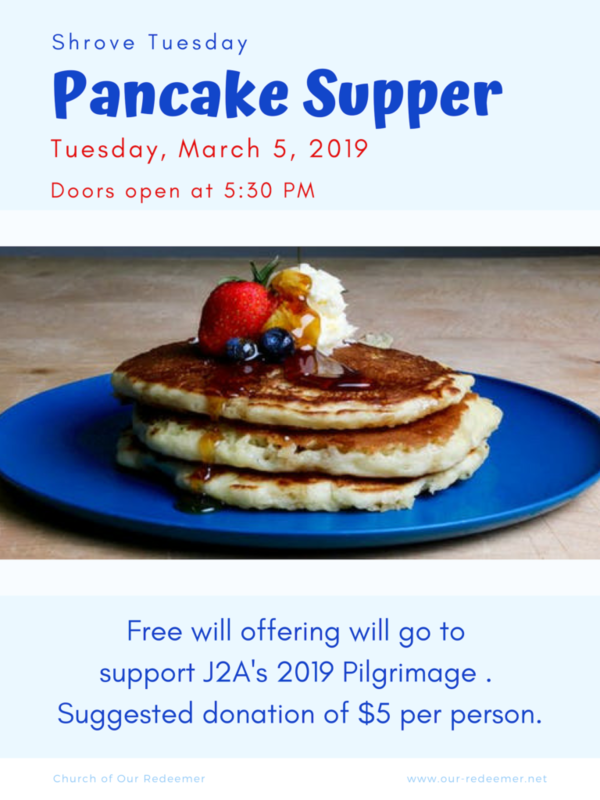 Doors open at 5:30 PM and a free will offering will go to support J2A’s 2019 Pilgrimage (suggested donation of $5 per person). Around 6:30 we’ll move upstairs to the sanctuary for worship leading up to the burning of the palms to make the ashes for Wednesday’s service. There will be stations with hands-on materials for us to prepare more deeply for Lent and Ash Wednesday by remembering our baptisms through scripture, song, water, holy oil, dirt, and light. We will conclude with the burning of the palms on the front steps of the church.